Is it really "spring"? Because it's been a freaking winter wonderland for the last few days. I swear we have over 2 ft. snow on my lawn. No bueno. Mostly for picture taking. It's no secret that I am hard on myself and I really hate putting up photos that are not up to my perfectionist standards (yeah like they're perfect, gag) and honestly I tend to hate every photo I take that isn't in direct sunlight. I just don't like how they look in comparison. However I've been really trying to get my lightbox and light set up to work to get some good photos so I can continue swatching with the absence of sun. Not to ramble, just thought I'd let you in on my thought process, and give you a glimpse into how crazy I am. In summation, I hope you don't hate these photos cuz I have obsessed over getting them to look good haha! Today I wanted to show you this polish, which I've been lusting over for a LONG time. 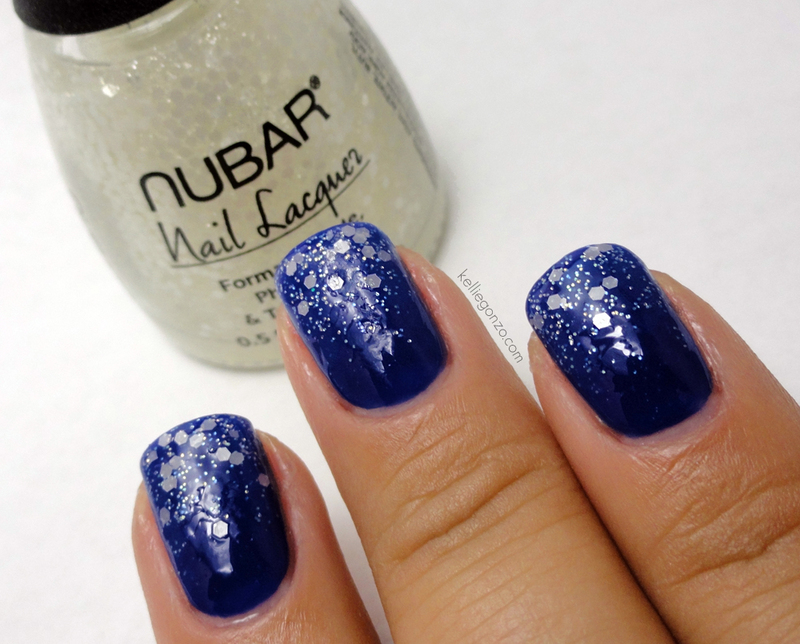 Nubar White Polka Dot is a clear polish with opal/white satiny hexagon pieces and tiny silver and blue iridescent glitter. At first glance you don't see the blue tint to the small glitters but once it's on the nail it sparks to life. I personally love the idea of satin finish glitter, meaning it's non-shiny. I did a gradient with the glitter over one of the new Rescue Beauty Lounge polishes (which is not out quite yet) called IKB:2012, a vibrant blue jelly. I know OPI has a similar glitter topcoat coming out in their SoftShades collection, but the small glitter is different I believe. 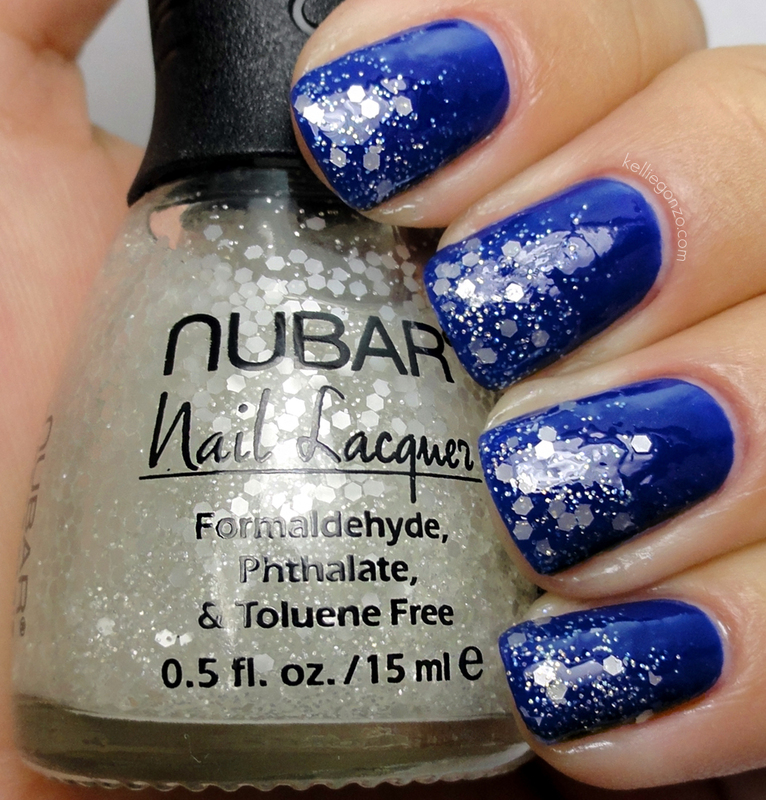 You can get this Nubar polish in a two-pack with it's black counterpart (to be reviewed soon) for $20 on http://www.bynubar.com/, or you can get The Painted Nail's version of this polish called Moon Drops for $12.50 on http://shop.thepaintednail.com/.